Although that last fight didn’t go as planned, I’m very happy to have come out of it (mostly) unscathed, and thus I am able to (for the first time in a long time) enjoy a quick turnaround between fights. On February 7th, I will be facing MMA legend and former IFL champion Ryan “The Lion” Schultz at the historic Paramount Theater in downtown denver. Schultz is a true veteran of the sport. 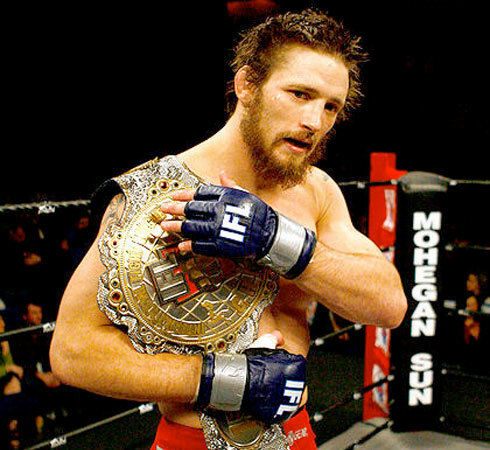 I distinctly remember doing roadwork on a treadmill early in my MMA career, and watching Schultz beat up the previously unbeaten rising star Chris Horodecki to win the IFL title, which he then defended several times before the promotion went under. Although he’s had his ups and downs, Schultz holds victories over several household names in the MMA community (Eddy Ellis, Gil Castillo, Jason Dent, Hiroyuki Abe, Aaron Rile, John Gunderson, and Roger Huerta to name a few). I haven’t had an easy fight for a long time, and you can add this to the top of the list of tough opponents I’ve faced. Tickets are available at the Easton Training Centers in Denver or Boulder, or you can call (720)837-7746 for a direct order.